Israeli natural gas exports have the potential to reshape energy dynamics across the Mediterranean, helping Israel and its neighbors to diversify their energy access. Regional political risks, however, loom large over export deals and further exploration. Five thousand feet beneath the surface of the East Mediterranean Sea lies the Leviathan gas field, the largest discovered natural gas repository since the turn of the 21st century. It is just the latest in a string of East Mediterranean oil discoveries that should allow Israel to become a significant exporter of natural gas over the next decade. 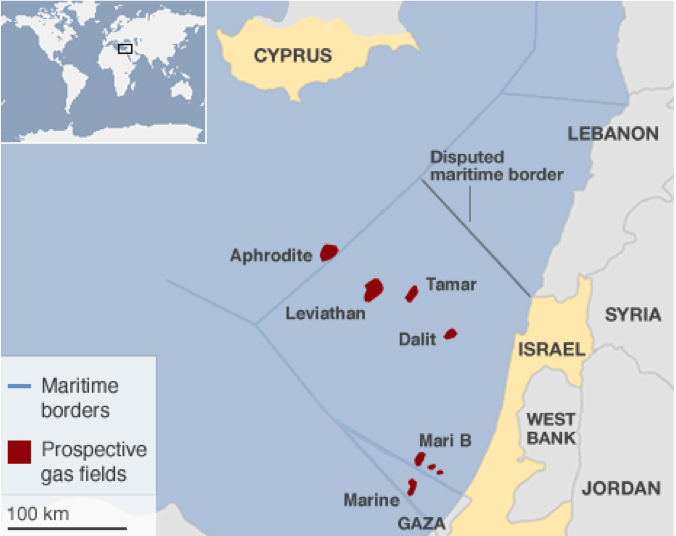 Situated 80 miles off the northern coast of Israel, the Leviathan holds as much as 19 trillion cubic feet (tcf) of natural gas. Combined with other recent discoveries, the East Mediterranean boasts more than 40 tcf of natural gas. Such large repositories are expected to meet Israel’s domestic natural gas needs for at least a quarter century. Demand for gas within Israel has grown as much as 17 percent per year as local business booms and the government continues to fund housing and commercial developments within Israel and the occupied West Bank. Although new gas discoveries offer Israel a form of partial energy security, they also pose a unique opportunity for the long-time natural gas importer to supply its Mediterranean neighbors with a new source of energy. Israel recently signed natural gas agreements with companies in Jordan and Palestine, which will supply them with energy resources from a neighboring 10 tcf gas field. An initial agreement with Jordan is set to last 15 years, with exports due to begin in early 2016. A consortium of Israeli and US-based companies, including Israel’s Ratio and Derek Drilling, and US-headquartered Noble Energy, leads exploration within the Leviathan gas field. They hope that new potential agreements with Egypt, Turkey, and Cyprus can help extend the reach of Israeli gas across the Mediterranean, and even to Europe and Asia. As Israel continues its exploration of the Leviathan field, it hopes emerging energy cooperation with Egypt will provide a new export market for its natural gas reserves. Soaring energy demand and a growing population have left Egypt’s liquefied natural gas (LNG) plants in desperate need of new supply. According to the Egyptian Electric Regulatory Agency, Egypt will lack 20 percent of the natural gas it needs to power its LNG plants this summer. The nation is in talks with the Leviathan consortium to build a sub-sea pipeline linking their LNG plants directly to the Leviathan field. While exports to Egypt would help to ease Egyptian energy shortages, they would also give Israel access to the Suez Canal. Access to this key waterway allows resources from sub-Mediterranean fields to reach Asian and South American markets, where LNG fetches roughly twice the price paid in Europe. Israel hopes the promise of new energy will help to normalize ties with Turkey, as well. Once close allies, Turkish-Israeli relations were severely damaged following a deadly attack by Israeli defense forces on a Turkish yacht carrying pro-Palestinian activists heading to Gaza in 2010. In light of recent unrest in Ukraine, however, Turkey is seeking to lessen its reliance on Russian gas, which accounts for some 67 percent of its total natural gas imports. Turkish energy officials are currently in talks with the Leviathan consortium to build a sub-sea pipeline connecting Turkish LNG facilities with Israeli gas fields. Construction of the pipeline could “begin in the second half of 2015,” according to Turkish officials. As is the case with Egypt, while Israeli gas would help to diversify Turkey’s energy access, it would also provide Israel with a potential link to the greater European energy market. Investors and bidders have jumped on board the Turkish Israeli project; ten companies have already presented construction offers. Should any deal with Turkey fall through, however, Israel is working to diversify its access to the European market by exporting natural gas to Cyprus. The Leviathan partners have submitted yet another bid to supply gas to Cyprus via sub-sea pipeline, or through a floating LNG storage unit. While opportunities to export the vast East Mediterranean natural gas discoveries abound, potential Israeli and foreign investments are underscored by domestic and regional political risks. Any potential Israeli-Egyptian deal would be subject to the ever-changing dynamics of the Egyptian political scene. Although the recent military coup and likely election of President Abdel Fattah al-Sisi have been positive for Egyptian-Israeli relations, political and social unrest within Egypt could delay and break any potential deal. Previous land-based gas pipelines between the two countries were constant bombing targets of Egyptian militant groups. While a sub-sea pipeline would be harder to target, political uncertainty is likely to fuel opposition from both sides. A deal with Turkey would have to overcome significant political hurdles, as well. Turkish Prime Minister Recep Tayyip Erdogan recently demanded that Israel lift its blockade on Gaza as a precursor to normalize relations. Relations have continued to be strained even following a recent apology from Israeli PM Benjamin Netanyahu for the 2010 flotilla attack. Turkey will want to be seen as at least trying to leverage better living conditions for Palestinians alongside any Israeli gas agreement, which could be a potential deal-breaker. Israeli natural gas exploration has also faced criticism from its neighbors in Lebanon. The Lebanese government is in the process of granting exploration licenses in East Mediterranean zones that Israel claims are part of their exclusive exploratory zone. The disputed region covers roughly 300 square miles, creating a greater Lebanese-Israeli dispute over their shared maritime border. Lebanon views Israel’s exploration as exploitation of their most valuable resource, heightening tensions between two countries that are technically still at war. Lebanese objections are not likely to dissuade Israel from extracting its claimed reserves, however. UBS AG is advising investors to buy shares in Ratio, one of the companies involved in the many Leviathan gas deals. Shares in U.S.-based Noble Energy have also significantly risen in value recently. The perils of Israeli natural gas exports have the potential to reshape energy dynamics across the Mediterranean. Political risk runs high, however, and only time will tell if new exploration and developments will provide an avenue to normalize relations or become the seed of yet another a regional conflict.